'Weapon X Vol. 3: Modern Warfare' review: Action heavy with a Logan focus – AiPT! An action-packed third volume that’s very Logan focused. 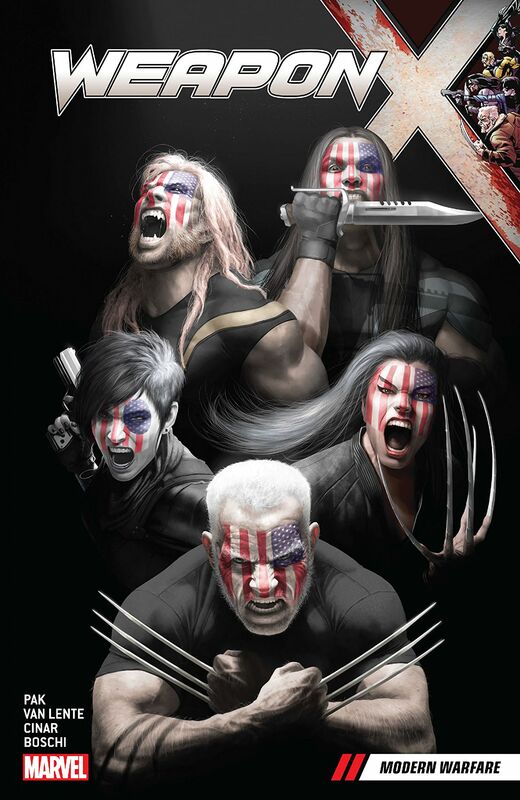 Weapon X is a series that works because of the dynamic of its team. Who would have thought Domino, Logan, Sabretooth, Lady Deathstrike, and Warpath would work? Sure, they’re all very willing to kill and a lot of them have a healing factor, but how could this bunch get along? Greg Pak clearly knew this team had a certain magic to exploit, which makes reading this a must read for many. I really enjoyed what Greg Pak built over the first two volumes of this series. Volume 2 was all about Weapon H, but this team remains the core of what makes it great. Killers and misfits alike, Pak shows how it’s good to be bad. Broken up over 5 issues, this volume follows a three issue story arc focused on Nuke and a two-issue story arc all about Sabretooth and Logan’s yearly mauling of each other. Pak writes the first three issues and it mixes in some good character beats and interesting social commentary to keep things interesting and realistic. The last two, written by Fred Van Lente, incorporates Logan’s alternate dimension reality into the mix further exploring the good side of Sabretooth. The first three issues reveal some interesting character developments as Domino and Warpath’s “will they or won’t they” finally gets a resounding answer. Logan’s slow understanding of this team’s purpose–which is partly to keep Lady Deathstrike and Sabretooth occupied enough so they won’t hurt innocent folks–further develops the team dynamics. The inclusion of Nuke, who was a big part of the death of Wolverine, explores another side of the Weapon X program and reinvigorates the character. He may be a screaming maniac, but it’s nice to see him back. The art in the first three issues is done by Yildiray Cinar. His work gives the title a grittier feel with a dark tone that suits the murderous story. Sabretooth revels in the killing of Nuke’d up villains and the art style works well with these moments. It also positively nails the Domino/Warpath love scenes. The last two chapters are drawn by Roland Boschi with Andrea Sorrentino jumping in to draw the flashbacks between Logan and Sabretooth in the Old Man Logan storyline. Boschi’s style gets at the chaotic core of Logan and Sabretooth going at it with no regard for each other well being. Logan is so old at this point is he really a runt? It’s hard to take the Nuke character seriously; he’s rather one note. Pak tethers him to a Central American political drama, but he’s still a screaming maniac who doesn’t add much to the narrative. Furthering this element is the last two chapters which don’t delve too deeply into Sabretooth or Logan’s relationship. For the most part, these chapters are all about feral action and not much more. My only other gripe is how uneven the art can be. Both artists can positively astound at times, but then there is an unfinished panel or page that throw things off. I’d bet deadlines are the culprit, but it still hinders the story. This is a good action-heavy trade paperback that Logan fans should really love. It not only utilizes a staple Wolverine villain with Nuke but gives readers a Sabretooth vs. Logan showdown. What more could you ask for?